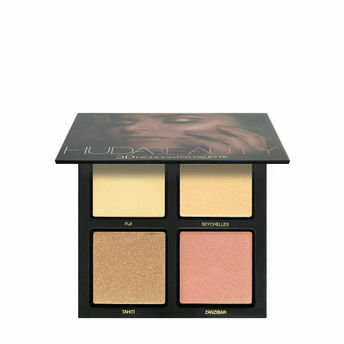 Inspired by Huda Kattan's hack of layering oil with powder highlighter to amplify her glow, this palette is packed with two different textures. The Melted Strobe, a pearlescent creamy formula enriched with karite butter, creates a flawless, lit-from-within canvas for layering powders. The three, light-catching pressed pearls are staggered in complimentary tones to give you sculpted, 3D radiance. With effortless blendability and layering power, this palette lets you build and sculpt your highlight to a desired level of radiance - from subtle, natural radiance to an all-over glow. - A highlighter palette with two different textures: a pearlescent creamy shade and three light-catching pressed pearl hues. - 0.35 oz/ 10.3 ml Melted Strobe Cream Highlight. - 3 x 0.28 oz/ 7.93 g Powder Highlight. Explore the entire range of Highlighters available on Nykaa. Shop more Huda Beauty products here.You can browse through the complete world of Huda Beauty Highlighters .Alternatively, you can also find many more products from the Huda Beauty 3D Highlighter Palette range.